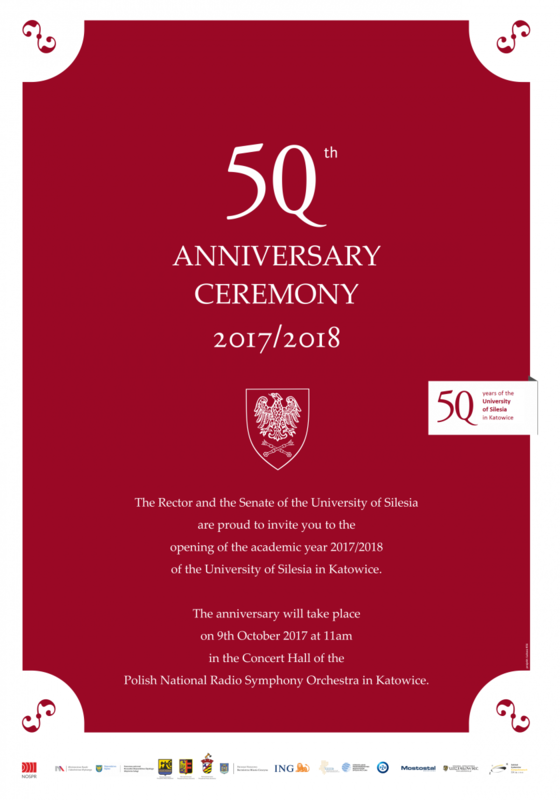 On Monday, October 9th, 2017, the University of Silesia will inaugurate the academic year for the 50th time. The ceremony will begin at 11:00 in the concert hall of the National Polish Radio Symphony Orchestra in Katowice (Wojciech Kilar 1 Square). The Rector of the University of Silesia and the Senate of the University of Silesia invite you to participate in the inauguration. The event will be broadcasted by the Internet Television of the University of Silesia at: www.telewizja.us.edu.pl/strona/on-line. Artistic performances of the University’s choir "Harmonia", Student Song and Dance Ensemble "Katowice", and Cieszyn Brass Band of the University of Silesia. At the inaugural ceremony of the academic year 2017/2018, newly admitted students and doctoral students of the University of Silesia will take the student’s oath and receive the student books. As a highlight of the event, the "Pro Scientia et Arte" award will be granted to the employees of the University of Silesia for outstanding scientific and artistic achievements. This important and honorable distinction can be awarded each year to two laureates: a scientist who represents the humanities and the arts - the prize will be granted to prof. zw. dr hab. Krystyna Heska-Kwaśniewicz, and a researcher representing mathematical-natural and technical sciences - the prize will be given to prof. zw. dr. hab. Paweł Miguła.